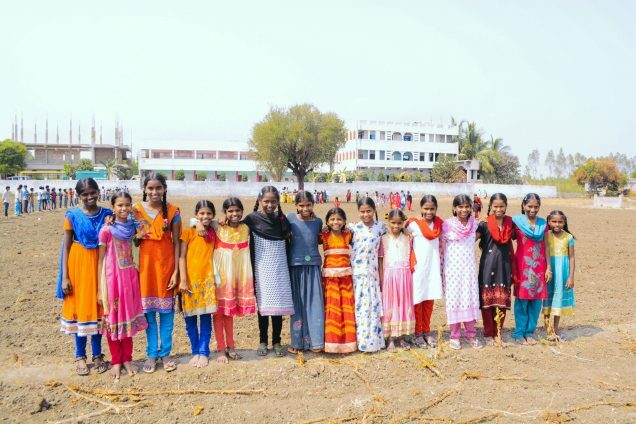 Photo: Children from our girls home gather to celebrate the purchase and dedication of the new land adjacent to their home. We are happy to report that in March we purchased 1.3 acres of land adjacent to our main campus, which will be used for an athletic field and future expansion. The acquisition of an athletic field is the final requirement for our new high school to gain accreditation. With your support, as early as May we hope to make further improvements to this new land: we want to build a wall surrounding the entire acreage and a small building to use for storage, and install brand new playground equipment for the children. The existing campus has become cramped with three major building projects — the main building which has the boys home on the ground floor and the girls home on the second and third floors; the second building housing the elementary school on the ground floor and the dining hall on the second floor; and the third, newest building is the high school building which is ready to be occupied when the high school is opened. Thus, these building projects have left little space for the children to play. But now the children are extremely happy about the new land because it will give them the play space of their dreams. The other requirements for our high school to gain accreditation had previously been met: the 31-seat school bus which we purchased in August 2015, enabling us to safely transport our children around the city as well as take them on fun excursions and field trips; and the construction of a new high school building, which was completed in September 2016, offering adequate classrooms, a lab room, a computer room, and an administrative office. Now that all three requirements listed by the government in order to obtain the permit to open the high school have been met, we can begin to make plans to sustain a budget to operate the high school in the 2018-2019 school year. These new 1.3 acres will triple our existing land area on the campus, so our other plan for this bountiful space is to grow an additional vegetable garden, which will expand our existing on-campus ground level gardens and rooftop box gardens. The land expansion will allow us to officially open the school for tuition-paying day students since there is not a local high school in the area, while also allowing our own resident high school students to stay on campus vs. being bussed off campus. 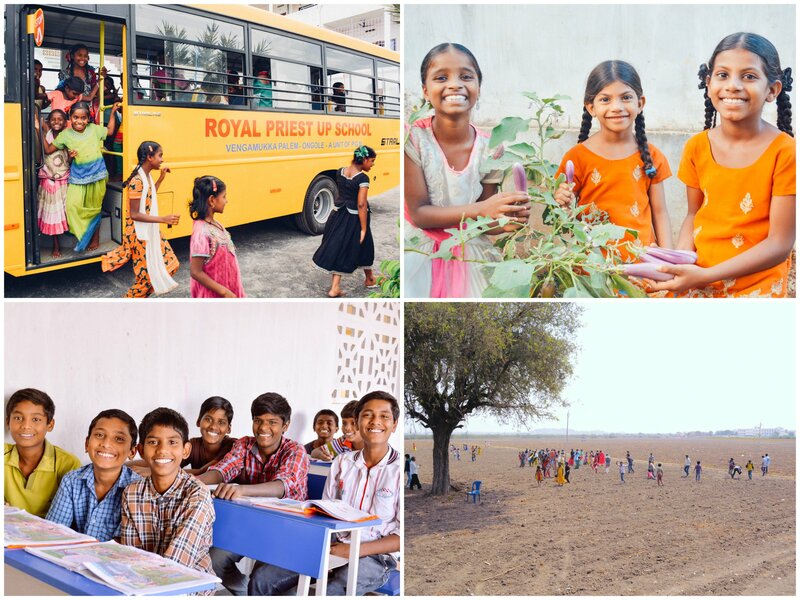 Both the vegetable garden and high school will contribute toward our goals for sustainability in our India programs. Thanks to the projected cash flow from tuition payments, we expect the investment to pay for itself in 8 to 10 years. Photo inset: (Top-left): Our school bus, purchased in 2015, is one of the requirements for our high school to gain accreditation. (Top-right): Our children living on campus are excited about the recent March harvest, which provides nutritious food for their meals. (Bottom-left): A new high school building was completed in 2016, another requirement met for accreditation. (Bottom-right): The recent purchase of 1.3 acres of land for an athletic field was the last item needed for accreditation of our on-campus high school. In March we gleaned a bountiful harvest of tomatoes, okra, eggplant, cucumbers, and curry leaves from our current ground level gardens. And thanks to our native team’s hard work in preparing our current rooftop box gardens for the upcoming planting season in June, we look forward to a harvest of tomatoes, curry leaves, okra, eggplant, beans, and cucumbers in August or September. With both of our garden projects flourishing, we are hopeful that we will draw a good profit (in savings) from the gardens, and we are thankful that the harvests of organic vegetables from our gardening projects add nutritious ingredients to the children’s meals.